TRENTON, New Jersey (WABC) -- New Jersey voters will have a chance to have their say Tuesday in a set of presidential primaries that have already been decided. Hillary Clinton, the former U.S. first lady and secretary of state, reached the 2,383 delegates needed to become the presumptive Democratic nominee on Monday, according to an Associated Press count. Presumptive Republican presidential nominee Donald Trump also has already secured the number of delegates needed to clinch his party's nomination. Voters will also pick their party's candidates in 12 U.S. House races. Seven incumbents face challengers Tuesday, and primaries in three other races across the state are competitive. The congressional contests have drawn less attention, mostly because it looks unlikely that any incumbents will lose, but a couple of races have gotten interesting. There are no Senate contests or state-level races this year in New Jersey. There are more than 2.6 million unaffiliated voters in the state, compared with 1.8 million Democrats and about 1.1 million Republicans, according to state data released in April. Unaffiliated voters can choose a party at their polling place Tuesday to vote in New Jersey's closed primaries. The deadline to change from Republican to Democrat or vice versa has passed. Clinton, who's also a former U.S. senator from New York, is leading Vermont U.S. Sen. Bernie Sanders in New Jersey, according to recent polls. A Quinnipiac University poll conducted last month showed Clinton leading Sanders by 14 percentage points. That poll surveyed 1,989 people and had a margin of error of 2.2 percentage points. Clinton has deep connections in New Jersey. She has the backing of most of the state's Democratic congressional delegation and party chairmen in all the state's counties. She also captured the state against Barack Obama in the 2008 presidential primary. In southern New Jersey's 1st District, Democratic incumbent Rep. Donald Norcross, the brother of insurance executive and party powerbroker George Norcross, faces a challenge from Sanders supporter Alex Law. Norcross has loaned his campaign about $235,000 and gotten a tail wind from an outside group that is spending $215,000 to help him. Law got about $10,000 in outside backing from another group. It's the only congressional primary in the state to have outside spending. Norcross has the party's support, including a recent endorsement from Obama, and is favored to win, but the contest has gotten personal, with both candidates using family members to attack each other. In the Burlington and Ocean County-based 3rd District, Democrats are vying to replace Republican incumbent Rep. Tom MacArthur, who contributed $5 million to his campaign in 2014. Tavern owner Jim Keady, whom Republican Gov. Chris Christie told to sit down and shut up during a 2014 news conference, is taking on Frederick John LaVergne, who lost two previous contests for the seat. Keady has been endorsed by the Ocean County Democrats and the national Democratic Congressional Campaign Committee, while LaVergne was endorsed by Burlington County's party. 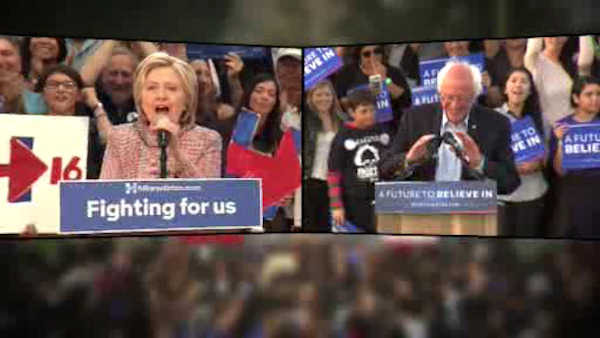 ABC7NY will have real-time results for the New Jersey primary on Tuesday. Click here for information on where to find local polling places.